Although it is possible to attach pictures to your post using the forum system the club only has a limited amount of space to store these pictures on their server. Every time we have to buy more storage space it uses funds the club could have allocated elsewhere. By using a free photo storage provider such as PhotoBucket to attach your pictures you're saving that money which can then be spent on other stuff for the club. 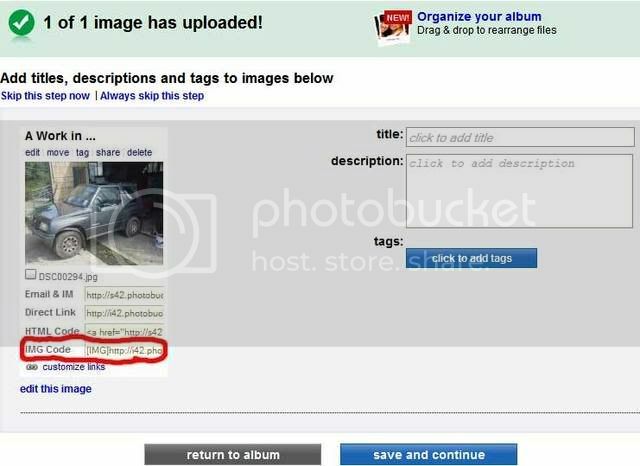 Here I have attempted to make a simple guide on how to use PhotoBucket to attach pictures to your post. Any feedback is always welcome. Firstly you need to go to http://www.photobucket.com and sign up for an account. Go to the homepage and click the button. Follow the instructions on there to get an account. Once you have an account you can start to upload pictures to it. If you're not already logged in go and log into your photobucket account. On the main page you'll see a box like this.. 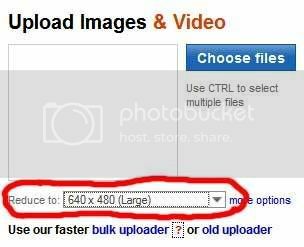 Always set the image size you're uploading to '640x480' before uploading your images. You can use '800x600' too but normally '640x480' is more than adequate for forums and should look good on the majority of users screens no matter what their settings are. You set the size using the drop down list circled in red. Once you've chosen the right size click on the button. This will open up a box where you can find the pictures on your computer you want to upload. You can select more than one picture in a folder by clicking them individually while keeping the 'Ctrl' key held down. Once you've selected all the files you want click 'Open' and you shouldd see your files being uploaded. Once they're done you'll be presented with something along the lines of the pic below. I only uploaded one pic in this example so you may have more than one depending on what you uploaded. If you want to you can now add a Title and Description to all your pics then select 'Save and Continue'. Otherwise click on the 'Skip this step now' link. 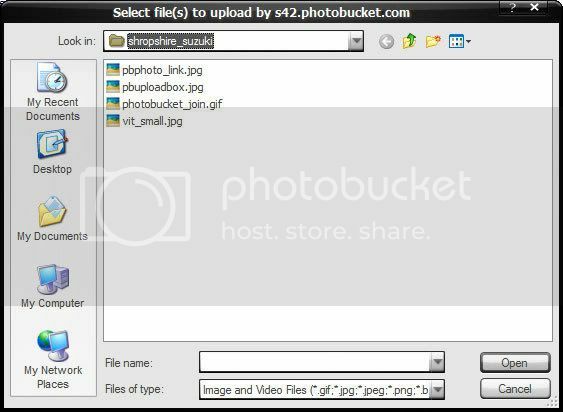 You should now be in your main PhotoBucket folder with all the pictures you've uploaded. Most recent first. To now use a picture you've uploaded on the forums you just need to select the IMG Code link below the picture you want to use. Click in the IMG Code box for the picture then click the right mouse button and select Copy (Or Ctrl and C on the keyboard). Then go to the forum post, click where you want your photo in your post then right click your mouse and select Paste ( or Ctrl and V on the keyboard). You should see a link appear in your post. To check its worked before posting you can always use the Preview option and see what it looks like. If you don't use the IMG links your picture won't appear correctly on the forum. Hopefully this has been a simple enough guide for everyone to follow. Any questions please ask away or come into the SS Chatroom and I'll talk you through it. Good Luck posting your pics! You can go into the photobucket settings and make your account private which means that if you post a picture noone can then use the link to look at everything in your albums. You can also have a guest password and can allocate pictures you don't mind guests seeing. I tend to just leave mine unprotected though as theres nothing particulary in there I'd mind people seeing. Last edited by 1nkling on Wed Feb 11, 2009 7:02 pm, edited 1 time in total. 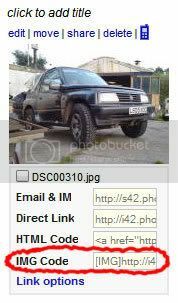 On the newer version of photobucket when you click in the IMG Code box it automatically copies the link.. Pops up briefly with 'copied'.. Try pasting in to your post and see if it pastes a link in.. If it does and its got the [IMG] tags around it then it should work.. You can preview your post to check its worked..